This year I purchased a few premade guinea pig soaps and enjoyed them so much I searched for and purchased soap molds to make my own. Below are photos of a few that I have made and painted to resemble real life accepted colors. These soaps are now offered for sale. The size is 4 inches long, 2 1/2 inches wide and 2 inches tall. 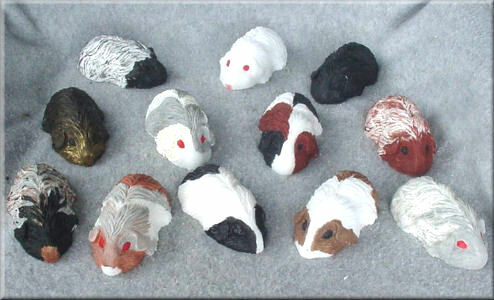 They are available in the original white or painted to match a favorite cavy. The introductory sale price is $7.95 each + plus shipping (when necessary).